A new app that allows users to book an in-resort massage at resorts across the French Alps is to be launched next week at the London Ski Show in Battersea Park. The new Alps Massage online booking App will allow skiers and boarders to book a mobile massage service to visit them in their accommodation with some services available to book with just an hour's notice, subject to availability. 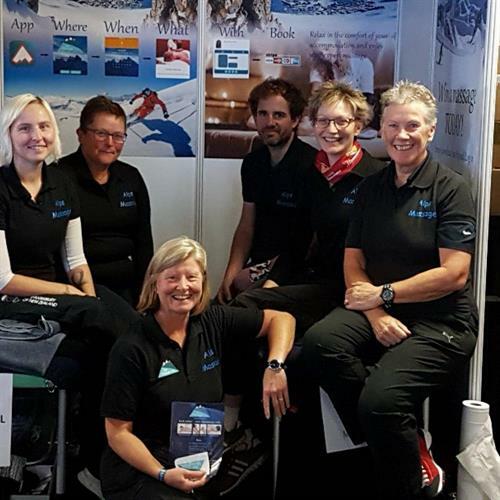 Ski Show visitors who visit Alps Massage at Stand 417 can meet the team (pictured top) and ask for a 10% discount on the service. They can also enjoy a mini massage at the stand and enter a daily completion to win a massage! The App enables users to book a massage in six clicks: Log in, select address, choose date, choose treatment, choose therapist, pay and receive an email confirmation. Take a look for yourself: https://www.alpsmassage.com you will find excellent massage therapists in Tignes, Chamonix, Les Gets, Morzine, Samoens, Saint Gervais, La Plagne, Saint Foy Tarrentaise, La Rosiere and Villa-Roger. We will do anything it takes to get to you for your Massage!